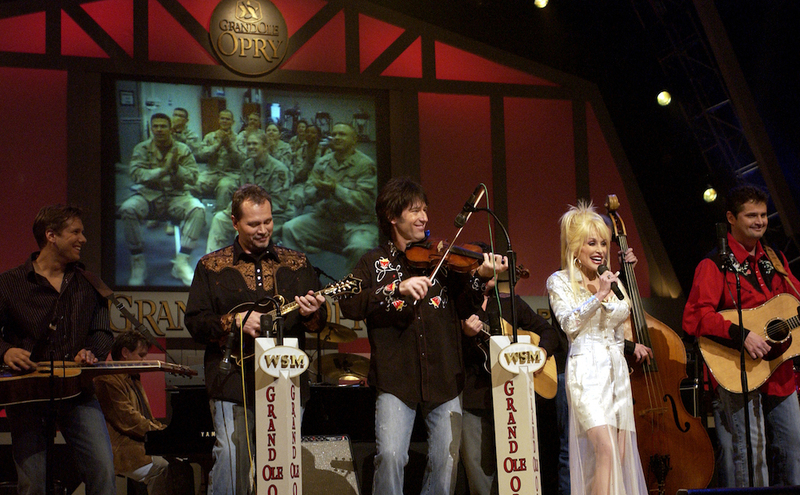 Dolly Parton performs at the Grand Ole Opry on April 23, 2005, as U.S. soldiers in Iraq watch via a live feed. Photo courtesy of Wikimedia Commons. Scherman’s impassioned farewell created something of a stir—but he was not the first and certainly not the last of the music’s obituarists who erred in assuming that cultures and cultural forms survive by resisting change rather than accommodating it. While the very name of “country” music emphasizes its cultural roots, it’s been shaped by commerce from the outset. The ballads and fiddle tunes favored by early emigrants from the British Isles might have constituted “folk music,” but by the end of the 19th century, as music writer Francis Davis observed, what a visiting folklorist might have seized on as “a supposedly authorless … song learned by ear for generations” could well have been picked up recently from a touring vaudevillian. Even though early 20th-century country music pioneers—like A. P. Carter of the famed Carter Family—played and sang songs from an oral tradition stretching several centuries deep into British history and culture, they were not purist collectors but professional performers who often reconfigured awkward chords and arcane lyrics into a mix more palatable to live audiences and record producers. Jimmie Rodgers, who is widely recognized today as “The Father of Country Music,” was one of the most truly innovative artists in American musical history. Rodgers made his recording breakthrough in July 1927, only five years after the first commercial country music record appeared. Punctuating his bluesy, black-sounding vocals with the melodic yodeling style he had learned from a traveling Swiss troupe, he also incorporated the Hawaiian steel guitar and the jazz trumpet of Louis Armstrong into recordings like his famous “Blue Yodel No. 9.” Though his life was cut tragically short by tuberculosis in 1933, his records sold 12 million copies over a six-year span. Rodgers also led the way as country performers shucked their overalls in favor of the more romantic garb of the cowboy already popularized on the silver screen, a makeover embraced by recording executives who feared that the old “hillbilly” image was too evocative of the daily drudgery and deprivation of the Great Depression. The Second World War brought some relief from that poverty, and changed the music in the process. The massive infusion of some $9 billion in wartime federal spending suddenly had the South sprouting not only military bases and defense plants but drinking and dancing establishments eager to relieve the locals of their newfound ready cash. These “honky tonks” (think “Bob’s Country Bunker” in The Blues Brothers) presented some new musical challenges, chiefly that of simply penetrating the din of dancing, rattling beer bottles, and drunken conversation. In such raucous settings, the softer vocals and acoustic guitars of the old hillbilly string bands quickly proved no match for amplified instruments and the transcendent twang of the pedal steel guitar. Much of the anxiety about changes in country music stems from its remarkably rapid transition from marginal cultural product to the perceived embodiment of fundamental American values. “Honky Tonk” music’s distinct sound came with place-appropriate lyrics, sometimes celebrating the fleeting but intense pleasures of a good buzz, but dwelling more often on the pangs of guilt and loss occasioned by habitual drunkenness, adulterous assignations, and dimly lit barroom romances that could not survive the light of day. Honky Tonk’s themes were the stock-in-trade of performers like Ernest Tubb, whose 1941 rendition of “Walking the Floor Over You” became an instant classic. But they reached their apotheosis a few years later in the music of Hank Williams. With America’s teens buying rock ‘n’ roll hits by the fistful, Nashville recording gurus Owen Bradley and Chet Atkins set out to woo their frazzled parents with the notably de-twanged’ “Nashville Sound,” marked by soothing background vocals and smooth string arrangements where a single fiddle gave way to a chorus of violins. Featuring the silky vocals of artists like Jim Reeves and Patsy Cline, here was an “easy listening” version of country music tailored for crossing over into the mainstream adult pop market. Tubb might seem a bit out of place in anything resembling a Hegelian dialectic. But in echoing what others had said about his own reworked rendition of country music scarcely a generation earlier, he joined an ongoing process of interaction where each successive departure from tradition both provoked and shaped a counter-response. In this case the Nashville Sound brought forth the “neo-honky tonk” style of George Jones and later the “Bakersfield Sound” of Buck Owens and Merle Haggard. Much of the anxiety about changes in country music stems from its remarkably rapid transition from marginal cultural product to the perceived embodiment of fundamental American values. Such changes appeared to reach warp speed by the 1990s as Garth Brooks ditched long necks for piña coladas and blitzed the touring scene with concert extravaganzas that made the Super Bowl halftime show look like a third-grade Christmas pageant. Then Canadian-born Shania Twain took “crossover” to a new level, scoring big on the international as well as domestic pop charts with songs like “C’est La Vie,” which borrowed heavily from one-time Europop sensation ABBA’s “Dancing Queen.” In protest, fed-up neo-traditionalists Alan Jackson and George Strait took center stage at the Academy of Country Music Awards Ceremony in 1999 for a duet bemoaning the “murder” of real country music down on Nashville’s “Music Row.” This somber pronouncement, mind you, came a full decade before the glaringly genre-ambivalent Taylor Swift began a 10-year run in which she was nominated for 26 Country Music Association Awards and won 12 of them. Because of their interactive nature, clashes between the would-be challengers and defenders of tradition have inevitably led to syntheses of the two approaches, meaning the boundaries of what truly constitutes “mainstream” country music have been in constant flux for most of its history and never more so than now. Early country music fans would surely puzzle over Bryan’s desire to flee the cushy confines of suburbia for a few hours out in the boondocks with his new girlfriend in his garishly over-optioned pickup. But then, back in 1920, 75 percent of Southerners still lived in the countryside, while roughly the same portion today reside in metropolitan areas. Nor are today’s country music followers facing the grinding poverty so familiar to their great-grandparents: With Nielsen surveys showing median household incomes approximately 26 percent higher than the national average, country fans have little trouble swinging loans for luxuriously appointed trucks. With pickups the nation’s best-selling vehicles, and commercials for them rife with country soundtracks and performers, it’s pretty clear that both Nashville and Detroit understand that the same folks are buttering their respective biscuits. Ironically enough, critics who focus on how far country music has moved away from what it was when first recorded nearly a century ago are in a real sense simply affirming how remarkably attuned it has remained to its ever-evolving base. James C. Cobb is a contributing editor at Zócalo Public Square and a Spalding Distinguished Professor of History Emeritus at the University of Georgia. His latest book is The South and America since World War II.